Things are drying out fast in Houston, with clear skies and dry days. Groundwork is continuing and making progress, with ducts and a concrete driveway now in place. Inside, our electrical conduits are in place. With them, our DUG Cool system is taking shape. 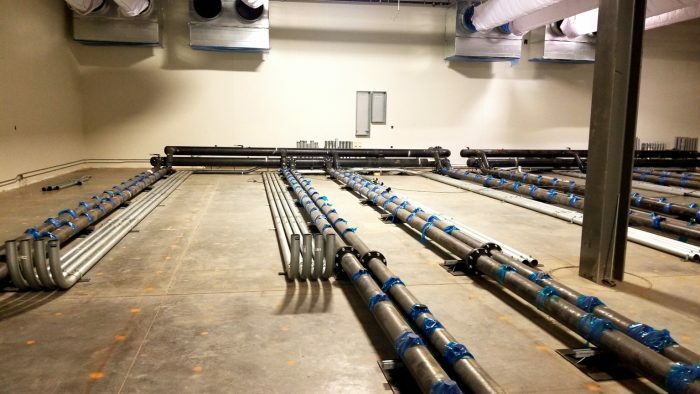 Many of the pipe manifolds (parts that branch into several openings) are already installed and installing the interior pipes is on schedule. The datacentre’s false floor is taking shape, starting from the southwest corner. This is a raised access floor that goes over the top of the floor’s pipes that can be lifted to access the pipework below. The forecast is staying dry, and more updates will follow soon!